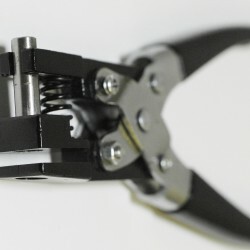 PowerPunchTM a heavy duty hand-held punch capable of easily cutting holes in the thick banner material. 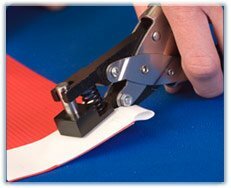 PowerPunchTM cuts cleanly through Banner Ups PowerTabs®, PowerTape®, and heavy duty banner substrates. Due to its relatively small size and light weight PowerPunchTM is completely portable and significantly lower in cost than benchtop grommet presses. 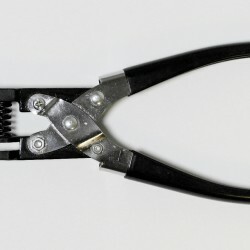 The tool will cut substrates up to 4.5mm” thick and is properly sized to make center-hole cuts in PowerTabs®. PowerPunchTM will have lots of uses around the shop. It’s powerful and durable, but unlike a benchtop grommet press, it is portable and much less expensive. This innovative tool has a replaceable punch that ensures long term durability far greater than paper punches or single-hole dies, which become dull quickly. 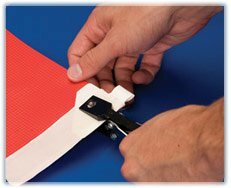 Cuts cleanly through tabs, PowerTape® and banner media. Heavy duty performance, yet lightweight to handle. Cuts a 5/16” hole. Perfectly sized for PowerTabs®. Replaceable punch for long life. Can now cut through Regular Banner Ups and media after applied. Easily punch holes in 4mm corrugated plastic and foamboard without deforming the board. 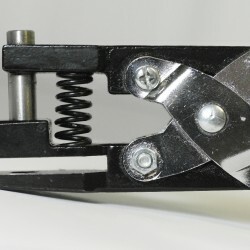 PowerPunch is used to punch holes through PowerTape, PowerTabs and banner substrates.